US Cities are abandoning recycling efforts because it’s too costly. And China no longer accepts even our sorted garbage. The Wall Street Journal reports Aluminum Makers Ditch Can Business.Used cans are piling up at scrapyards because U.S. aluminum companies are turning fewer of them into new metal, another indication of the economic challenges facing recycling.Arconic Inc. and other aluminum rollers are producing less sheet for beverage cans and more higher-margin, flat-rolled aluminum for automotive and industrial components. Prices for used aluminum cans in the U.S. have fallen about 30% since last summer. Old cans are less versatile than other scrap. The makers of airplane and car parts prefer not to use aluminum made from recycled cans. More new cans in the U.S. are made from imported aluminum. 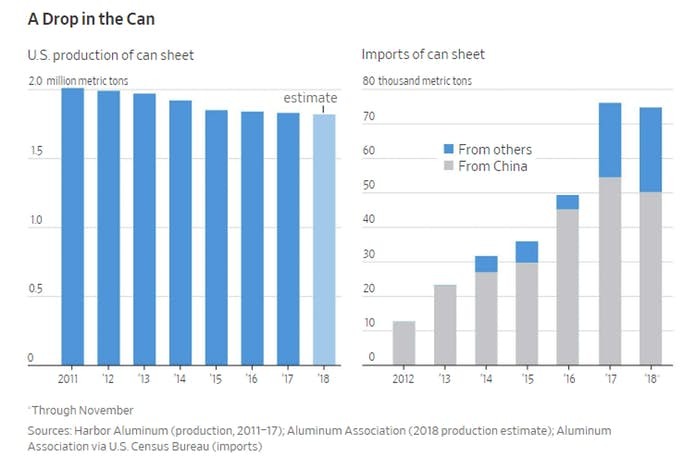 As a matter of “national security”, tariff man Trump put huge tariffs on steel and aluminum when, despite the tariffs, the US does not produce enough sheet aluminum to supply demand. People don’t distinguish between aluminum and steel. People don’t distinguish between greasy pizza boxes and clean paper. We now need a massive publicity effort to tell people if in doubt, don’t recycle. It’s possible. The answer depends on whether or not China stopped importing sorted US garbage in response to Trump tariffs. That’s the appropriate campaign whether or not China accepts US garbage or not. Perhaps they have stopped, not because of Trump, but because there is too much garbage in our supposedly sorted garbage.